Wall art is meant to enhance the interior beauty of your house and the rooms where ever the wall art is done. Several materials are used in the wall art technique. 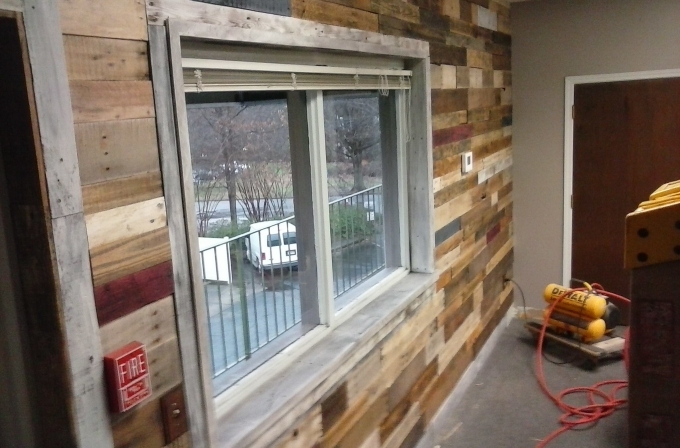 But as we specialize in the pallet wood art craft ideas, so we would be specifically focusing on the wooden pallet wall art ideas. 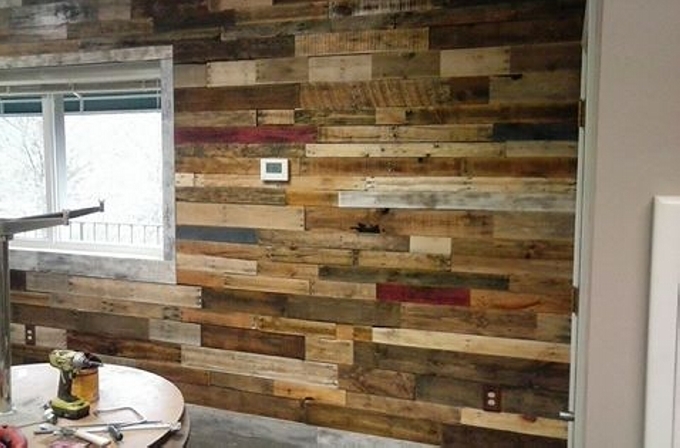 Now arises the question that how come the pallet planks could be used in plain wall art, so the answer is so simple and straight. We would be dis assembling the whole pallets and we would cut to size the obtained pallet planks. And then we would be pasting them along the wall. Here in this picture we see a whole wall embedded in wood. This wood is basically obtained from the raw pallets that were lying idle in the backyard since months. We have planned to make best use of them. This seems to be a huge room having a 4 by 6 window which is installed in relatively very large rooms. And then for the purpose of decoration and quality pallet wood is utilized in best manner. 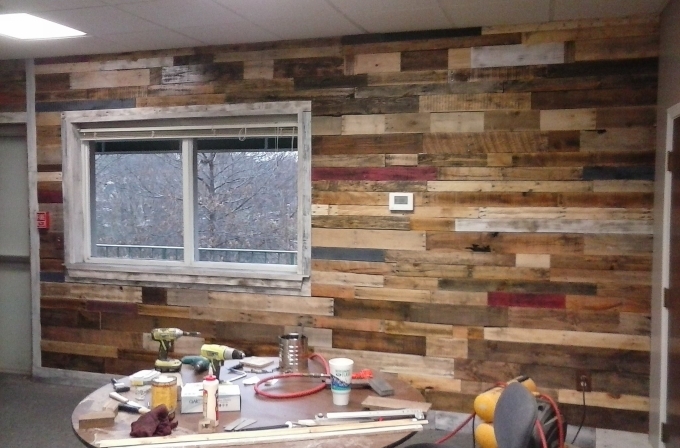 We can see on the whole wall that a whole range of pallets is used here in wall art. 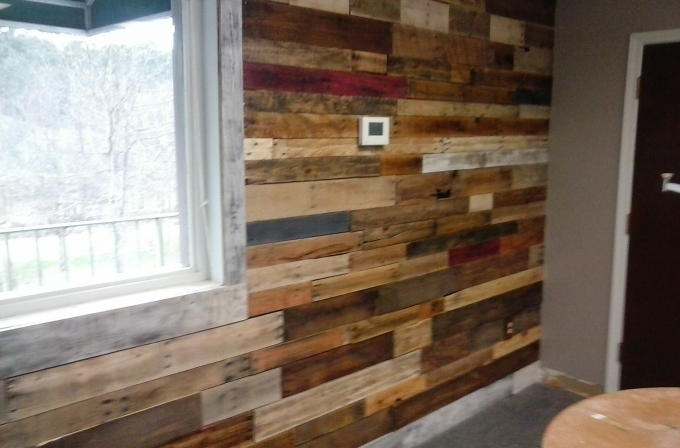 The pallets used here in this wall art range from some fresh to the deteriorated ones as well. As we needed the timber in a very huge quantity so no special care has been taken in collecting the wooden pallet planks as it would have become hard to arrange that much fresh pallets. If you go out there in the market to have such a wall art, it would cost you beyond your imagination. And here in this project, we have got it fixed almost free of cost. Just some minor expenses are incurred.